Our beautiful riverside conservatory is the ideal setting for your wedding ceremony, this airy and bright room can accommodate up to 70 people for your ceremony and with white chair covers and matching bows will look absolutely stunning. In the summer months you can use the riverside balcony for drinks and photography. In the winter months sparkly lights and a roaring log fire will set the mood in this stunning room. Our newly refurbished function suite, for up to 90 guests for a sit down meal and up to the 140 evening guests for your reception or party. 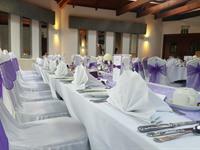 See whats new at the Dalgarven House Hotel......our newly refurbished riverside conservatory with its beautiful outlook over the river Garnock, is the perfect setting for you wedding ceremony or smaller wedding breakfast, for larger celebrations our refurbished and fully air conditioned suite can hold wedding meals for up to 90 guests or evening receptions for up to 140 guests, our brand new lounge bar gives a welcome addition to these facilities. 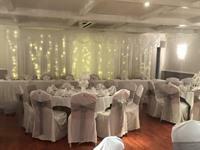 We offer a range of all inclusive wedding packages which include features such as chair covers, sparkly backdrop curtain and such like as standard, all food is freshly prepared and of restaurant standard, we are sure we will delight you. The owners Alexandrea or Volker would be delighted to discuss your individual requirements personally with you. The Dalgarven Water Mill and the weir at the River Garnock offer a stunning back drop for your wedding photography.